Rosalind McAllister is the newest creative writing teacher at Arizona State Prison… Rose is determined to prove herself to her criminal students and not let them break her—like they did the last teacher. But when she meets Jagger Reed, she immediately knows the line between student and teacher could be easily blurred. Tall, intimidating, and way too handsome to be incarcerated, she vows to keep him at a distance. A creative writing assignment turns into the discovery of Jagger’s innocence… When Rose reads Jagger’s creative writing piece, she’s both astounded and impressed. His written words call to her, providing a window into his private world. But as the assignment continues, she discovers facts about Jagger’s conviction that change everything. Determined to piece together clues that leap out from the pages, she finds much more than an articulate prisoner. How can she save a man who doesn't want to be saved? And can she stop her heart from getting involved while… Defending Jagger? I had the privilege of receiving this book via Quirky Blind Date for my reading pleasure. My review is voluntary and I received no compensation whatsoever. When I received this book, I had no idea what to expect, as I never heard of the author before. This was a new experience for me; however, based on the synopsis I figured that it would be an interesting journey. Defending Jagger tells the story of a young man sentenced to spend twenty years of his life in prison for a crime he did not commit and the teacher who made it her mission to prove his innocence. Rosalind McAllister teaches creative writing at the Arizona State Prison. She chose this career as she hoped to make a difference and she believed that in teaching in the prison system she could accomplish that goal. She is brave, intelligent and compassionate. She had her share of disastrous relationships; as such, she was not looking for love. Therefore, the last place she expected to find it was in a prison. Jagger Reid worked his way into my heart the moment I met him. Adapting to prison life changed him in many ways, but the one thing that remained the same was his compassion. He did not have an easy life growing up, but he tried to make the best of it. He was a natural protector, which was clear from the fact that he was willing to go to prison for a crime he did not commit, in a bid to protect his brother. He was selfless and never did he stop to think about the effect that his actions would have on him. The secondary characters were interesting, but the one that intrigued me was Cutter. I hoped for more information about him, but it was not forthcoming. I knew why he was in prison, but I had no idea as to the circumstances that led to that particular incident. Who was he? What kind of life did he have while growing up? Based on how he related to Jagger, he did not strike me as a cold-blooded person. I found his banter with Jagger entertaining. Their bond went beyond friendship. The story elicited a range of emotions. It made me laugh, angry and sad. I laughed at Cutter and Jagger’s antics, I was angry, when I learned about the issue surrounding Jagger's incarceration and I was sad for all he had to endure in prison. 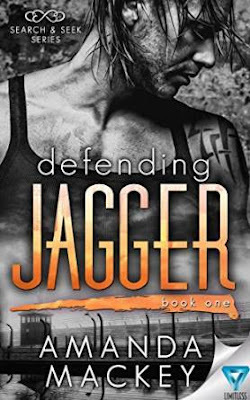 Defending Jagger is an engaging read and emotional story about the sacrifices made for the ones we love. It demonstrates how easy it is for one to pass judgement on others without knowing their circumstances. It will tug at your heartstrings and have you turning the pages, as you will be eager to know the outcome.